As we’ve chatted about before, protein levels do not need to remain nearly as high during maintenance mode, it’s just during fat-burn mode that we need that protein higher to protect and build that muscle. #3 Pick a few of these tips and just get started…You can add more as you move along in your journey! Plant-based protein powders are just different in their composition (obviously :)) as compared to their grass-fed whey counterpart. Plant-based powders can tend to the gritty or chalky side but that does not mean you’re doomed. There are lots of great ones out there. Everyone’s taste buds are so different…One that I hate another person absolutely loves. Strangest thing 🙂 So my recommendation (besides seeing the protein powder guide in the members area) is to check out ones where you can buy single packets of first before you commit! -You can mix it into veggie “pasta” (i.e. zucchini noodles, spaghetti squash etc…) dishes or add as a topping to these dishes or roasted veggies themselves! 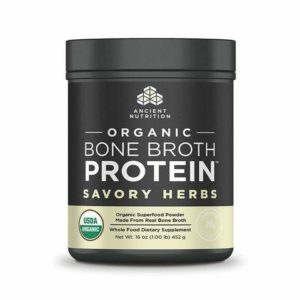 P.S…The organic bone broth protein savory herbs does come from organic chicken bone broth…So you may want to avoid if you are averse to consuming any animal products even in a powdered form. 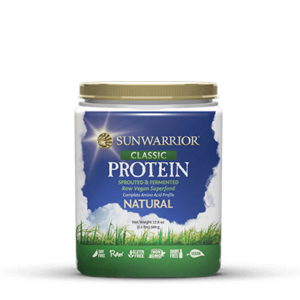 The Sun Warrior Natural unflavored protein is totally plant-based. You don’t want to do dairy all day long 🙂 So think moderation with it! Dairy can be inflammatory for the body so that’s why using it in moderation with your nutrition is key and also balancing that inflammation with awesome alkalizing foods & veggies. Greek yogurt will be your top protein source in the dairy department. You can add grass-fed cheeses, kefir, cottage cheese, milk, etc… in moderation as well. Hemp seeds are one of my faves to mix into yogurt for an extra protein & nutrient boost…It’s also great to sprinkle into salads or other casserole-type dishes. This is another food that you want to think moderation for sure…But it definitely can be an option to help boost your protein during times of fat-loss. Just make sure it’s always non-gmo and organic (most ideal) to avoid gmo’s and other yucky pesticides etc…and also that you’re not buying junk food disguised as health food. A soy protein hot dog is not something your body needs 🙂 You’ll be better off opting for some straight, unadulterated organic edamame! -Organic sprouted tofu (Trader Joe’s has a great one!) makes a great filler for “meat” in dishes. I love to sauté it in a skillet with some coconut oil & garlic. –Know Better Pasta is made entirely from chickpeas and has a great protein content & other nutrients! -Cappello’s Paleo Fettuccine has less protein than the above mentioned chickpea pasta but definitely packs some nutrients with its ingredients of almond flour & eggs! #9 If you can/will eat fish (which would technically make you a pescatarian :)…eat fish! Ideally, you want to aim for wild & sustainably caught fish. You want to avoid farmed/farm-raised fish like the plague. There’s a whole host of problems with farm-raised fish for your health and for the treatment of the fish themselves. -make up some salmon or tuna cakes (like crab cakes)…These are great to make in bigger batches to use throughout the week! Nuts definitely contain protein, but they’re more classified as a fat because of the fact that they have more fat than protein. However, it’s still a source of protein! As you’ve probably learned by now many foods are not just one macronutrient source. They’re a combination of two or all three macros (protein, fat, carbs). Nuts/nut butters happen to contain all three macronutrients…Fats, carbs, & protein. Enjoy! This is not a protein-boosting idea, but it definitely has some wonderful nutrients and antioxidants, and tastes awesome! It’s actually a fruit that is predominantly native to India, and it’s used in all kinds of ways. But specifically, for vegetarians it can make an amazing meat substitute without all of the worries of soy products or other processed foods. I mean doesn’t a “pulled pork” bbq sandwich sound amazing?! Just do a simple Google search for “jack fruit recipes” and you’ll find a whole new world for yourself. Like I mentioned above, this is not a protein-booster…it’s a fruit which makes it predominantly a carb source. That’s not a bad thing. It just lets you know that if you’re looking to up your protein you’ll need to scope out another source. These are not personal endorsements of mine, just some sites that I have found some yummy recipes on! Especially Skinny Taste as they include all of the macronutrient info already calculated for you. #WINNING! !